Leon Battista Alberti (February 14, 1404 – April 20, 1472) was an Lives of the Most Excellent Painters, Sculptors, and Architects. 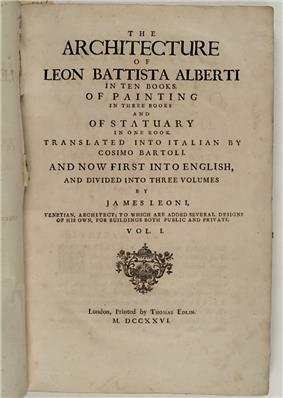 Leon Battista Alberti was born in 1404 in Genoa to a wealthy Florentine father who had been exiled from his own city, but who was allowed to return in 1428. 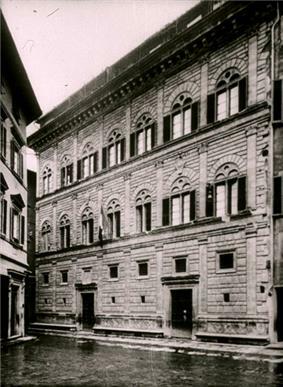 Alberti, whose mother is unknown, and who was probably illegitimate, was sent to boarding school in Padua, then studied Law at Bologna. He lived for a time in Florence, then travelled to Rome in 1431, where he took holy orders and entered the service of the papal court. At this time he studied the ancient ruins, which excited his interest in architecture and strongly influenced the form of the buildings that he designed. 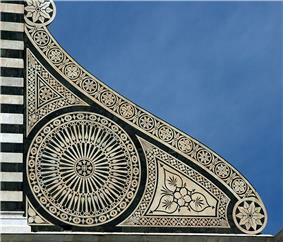 Alberti was gifted in many directions. He was tall, strong and a fine athlete, who could ride the wildest horse and jump over a man's head. He distinguished himself as a writer while he was still a child at school, and by the age of twenty had written a play which was successfully passed off as a genuine piece of Classical literature. In 1435, he began his first major written work, Della pittura, in which, inspired by the burgeoning of pictorial art in Florence in the early 15th century, he analyses the nature of painting and explores the elements of perspective, composition and colour. In 1438 he began to take a serious interest in architecture, encouraged by the Marchese Leonello d'Este of Ferrara, for whom he built a small triumphal arch to support an equestrian statue of Leonello's father. In 1447 he became the architectural advisor to Pope Nicholas V and was involved with a number of projects at the Vatican. 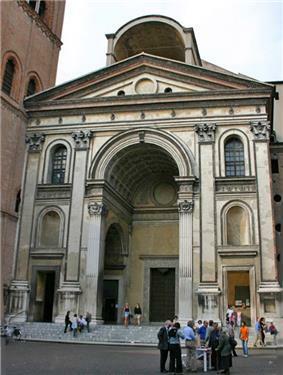 Alberti was employed to design two churches in Mantua, San Sebastiano, which was never completed, and for which Alberti's intention can only be speculated, and the Basilica of Sant'Andrea. The design for the latter church was completed in 1471, a year before Alberti's death, but was brought to completion and is his most significant work. Alberti, having taken holy orders, remained unmarried all his life. He loved animals and had a pet dog, a mongrel, for whom he wrote a panegyric, Canis). Vasari describes him as "an admirable citizen, a man of culture.... a friend of talented men, open and courteous with everyone. He always lived honourably and like the gentleman he was." Alberti died in Rome on April 20, 1472 at the age of 68. English title page of the first edition of Giacomo Leoni’s translation of Alberti’s De Re Aedificatoria (1452). The book is bilingual, with the Italian version being printed on the left and the English version printed on the right. Michelangelo, emphasized Alberti's scholarly achievements, not his artistic talents: "He spent his time finding out about the world and studying the proportions of antiquities; but above all, following his natural genius, he concentrated on writing rather than on applied work." Leonardo, who ironically called himself "an uneducated person" (omo senza lettere), followed Alberti in the view that painting is science. However, as a scientist Leonardo was more empirical than Alberti, who was a theorist and did not have similar interest in practice. Alberti believed in ideal beauty, but Leonardo filled his notebooks with observations on human proportions, page after page, ending with his famous drawing of the Vitruvian man, a human figure related to a square and a circle. In On Painting, Albert uses the expression "We Painters", but as a painter, or sculptor, he was a dilettante. "In painting Alberti achieved nothing of any great importance or beauty," wrote Vasari. "The very few paintings of his that are extant are far from perfect, but this is not surprising since he devoted himself more to his studies than to draughtsmanship." Jacob Burckhardt portrayed Alberti in The Civilization of the Renaissance in Italy as a truly universal genius. "And Alberti was to Leonardo Da Vinci as the finisher to the beginner, as the master to the dilettante. 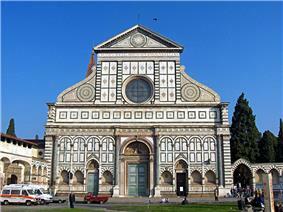 Would only that Vasari's work were here supplemented by a description like that of Alberti! The colossal outlines of Leonardo's nature can never be more than dimly and distantly conceived." De Pictura, 1435. , in EnglishOn Painting, , in LatinDe Pictura, On Painting. Penguin Classics. 1972. [De re aedificatoria] (1452, Ten Books on Architecture). Alberti, Leon Battista. De re aedificatoria. On the art of building in ten books. (translated by Joseph Rykwert, Robert Tavernor and Neil Leach). Cambridge, Mass. : MIT Press, 1988. ISBN 0-262-51060-X. ISBN 978-0-262-51060-8. 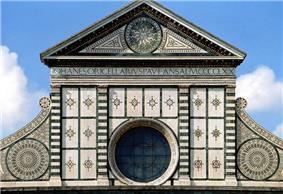 ^ In Italy, this first name is usually spelled "Leone", but Alberti is known as Leon. ^ a b c d Jacob Burckhardt in , 2.1The Civilization of the Renaissance Italy, 1860. Gille, Bertrand (1970). "Alberti, Leone Battista".